Everyone has strange tendencies. Some people exhibit OCD inclinations such as extreme hand-washing (not an Olympic event). Other people have creepy behaviors like collecting baby doll heads. Compared to those people, I’m not crazy at all. Don’t pour me a glass of milk. This makes total sense to me, but my husband thinks I’ve fallen off the planet Lactosia. First, other people don’t know the EXACT amount of milk I need. Second, they might pour it too soon, and it will be warmish. Milk should be ICE COLD. If I eat one Oreo, I must finish the entire package. I’ll tell myself that 3 cookies is one serving. But in my heart, I know that isn’t true. One package is one serving. 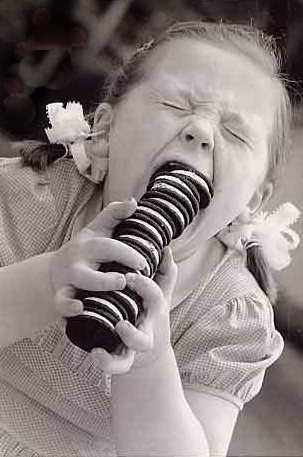 I’ll eat Oreos until my stomach aches and my poop turns black. And I’ll keep eating Oreos, even after that. It’s an illness. Don’t touch my sides. Or any part of my stomach. Or anywhere near my stomach. This is something from my childhood, I’m sure. Probably from when I was being tickle-tortured by my grandpa. If anyone touches my belly region, they usually end up with a fork stuck in their cheek. Consider yourself warned. Don’t make me a piece of toast. I don’t care if it’s Mother’s Day and my darling children bring me breakfast in bed. I have strict rules for toast-making, and I’m pretty sure you don’t know them. 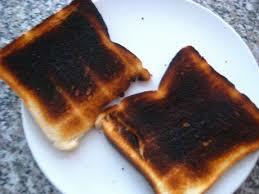 The toast must be toasted perfectly, by my standards. You don’t know my standards. There must be the correct amount of butter melted into the bread and, like my milk, it must be served at the correct temperature. If my toast isn’t still steaming, it goes in the dog dish. My foot must be outside the blankets. Otherwise, I get buried-alive claustrophobic and wake up screaming. I’ve told my husband that when I die, he has to cut a hole in the casket so my foot can stick out. Might make for an awkward viewing, but I don’t care. I’m dead. I can’t listen to stupid people for any length of time. Self-explanatory. I creak. If you’re next to me in a yoga class, you’ll think you’re practicing next to a box of Rice Krispies. Just don’t pour milk on me. So now you won’t be offended if I come to your house and eat all your Oreos, but won’t drink your milk or eat your toast. And don’t take it personally if I punch you in the throat if you brush up against my obliques. Just an involuntary reaction. What is your quirky behavior? I like to retrieve the mail from the box with only my slippers on. Does that count? Yes. Especially if you mean ONLY your slippers. Haha I love it! I’m the same way with people touching me anywhere near my stomach. I’ve had a few freak outs on tour, and a few violent retaliations. How about hands to yourself, jerks? There’s nothing funny about tickling me in public. People don’t know how close they are to death when they think they’re being funny. I’m the same way about my stomach area – I can’t stand being touched there! I won’t eat plain yellow m&ms. They taste like bananas, which I I like, but not in my candy. And this is the part where everybody says, “They don’t taste like banana. They all taste the same.” Yes, I know what you think. You’re wrong, though. Perfectly quirky behavior. I approve! – My tea should have cream. 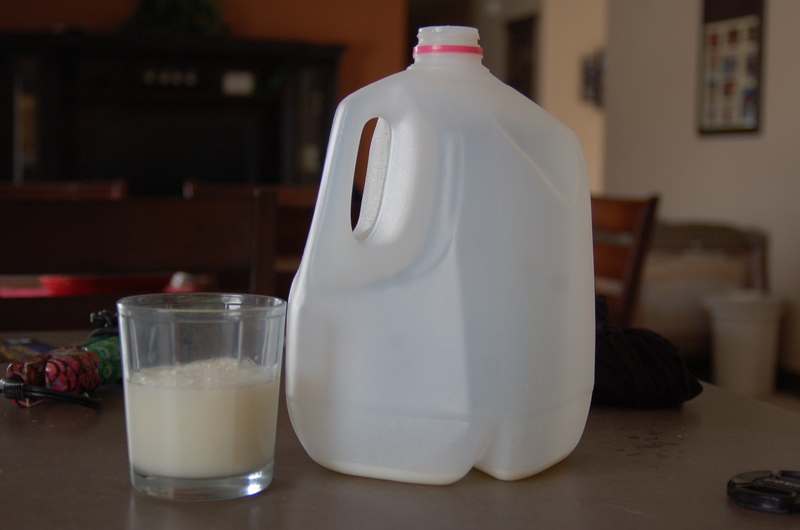 NOT milk. And just enough to make it a certain colour. – I do NOT like my food to touch. Like potato salad, coleslaw, beets… Nope, nope, nope. I don’t want mayo on my chicken wings, or purple on my rice, thanks. – The bathroom window has to be closed for shower time. – At a certain point during the night, I don’t want any pillows. Other than that time, I want two. Fluffy. Love it! Welcome to my quirky world!